In a similar arrangement to last season, Sky Sports F1 will show every grand prix, qualifying and practice session live throughout the year, with the trip down under the first of ten race weekends exclusive to the channel. BBC Sport will have live TV coverage of nine race weekends throughout the season, plus extended highlights of the other ten rounds on the 19-race calendar. Last year’s curtain-raiser was dominated by McLaren with Lewis Hamilton who earned pole in qualifying in his McLaren, but he could only finish third as then team-mate Jenson Button took the chequered flag. Hamilton has since jumped ship to Mercedes and the respective fates of the former team-mates will be one of the major themes of this year’s campaign. Button has been joined at McLaren by former Sauber driver Sergio Pérez and it will be fascinating to see how the pair shape up. The Mexican is something of an unknown quantity and some have questioned whether he was the best possible choice to replace Hamilton at the team. On the other hand, Button may well flourish now that McLaren no longer have to satisfy two superstar names with drastically different racing styles. The concluding two parts of Australian Grand Prix Qualifying have been delayed until Sunday morning in Melbourne following heavy rain during the session on Saturday. Only the first knock-out part of qualifying (Q1) was run at Albert Park as race director Charlie Whiting decided conditions were too dangerous for the session to continue. The decision to postpone the session until race day morning was made at 18:50 local time, with the light was also fading. Q2 and Q3 will now be run at 11.00am local time (12midnight UK time) on Sunday, with live coverage on Sky Sports F1 and a special highlights programme on BBC One. The scheduling of the race itself remains unaffected and will start at 6.00am. Hamilton’s decision to join a team that was a long way off the pace last time out has already been placed under great scrutiny. A title challenge seems unrealistic, but the 2008 world champion will expect his new employers to produce a car that can win races. If drastic improvements aren’t made, Hamilton could face a frustrating year. Three-time defending champion Sebastian Vettel is more than likely to be the man to beat once more. Red Bull overcame their early-season struggles to provide the German with a car that was able to eat up Fernando Alonso’s nigh on 40-point lead and deny Ferrari the constructors’ championship. Alonso can never be written off, though. The Spaniard has narrowly lost out on the drivers’ title in two of the last three seasons and will be desperate to return to the summit of the sport once more. For the first time, drivers will take to the Aussie track using supersoft tyres following their nomination by Pirelli. The Italian suppliers have taken the decision to provide this compound, alongside medium tyres, for the meeting Down Under in the belief that it will give teams more options when deciding on a strategy. Drivers and constructors had the first opportunity to put these tyres to the test in pre-season testing at Jerez and Barcelona in February and early March. There were some interesting stories across the twelve days of official winter testing with all the front-running teams looking like they have produced quick cars for the 2013 season. As is so often the case in pre-season the outcome of the first race looks impossible to call, with pundits split between Red Bull, Ferrari, McLaren and Mercedes. Sebastian Vettel became the youngest ever three-time world champion when he won last year’s championship by fending off the challenge of Ferrari’s Fernando Alonso. Competition is set to be just as fierce this time round with all the big names looking to mount a title challenge from behind the wheel of their 2013 cars. You can follow all the action from the opening round of the 2013 FIA Formula 1 World Championship on Sky Sports F1 and BBC TV. Sky Sports F1 HD will capture all the high-speed excitement exclusively live from the opening race weekend of the 2013 season. The channel will be the only place to watch every session of the 2013 Australian Grand Prix as it happens. Simon Lazenby will present full coverage of the Friday practice sessions, qualifying and the race itself, where he will be joined for expert analysis throughout the weekend by Martin Brundle, Johnny Herbert and Damon Hill. Commentary on all sessions comes from David Croft. He will be joined by Anthony Davidson for the practice sessions, and then Martin Brundle for both qualifying and the race. Kravitz and Pinkham will also present The F1 Show live from the Melbourne paddock on Friday morning, where they will give viewers all the latest news and behind-the-scenes features post-practice. As in 2012, Sky Sports F1 will provide viewers with a number of ways to keep up with all the live action. Press the red button during live coverage to access Sky Race Control, an interactive service offer subscribers the chance to create their own viewing experience once again, from on-board cameras and live radio channels between team and car, to up-to-the-minute race data and statistics. Plus with Sky Go, you can watch the drama unfold wherever you are on iPad, iPhone, selected Android phones and laptops. BBC TV will have free-to-air coverage of the opening race of 2013 with extended highlights of both qualifying and the race on BBC One and BBC One HD. Suzi Perry returns to BBC Sport to become the new face of the corporation’s coverage for the 2013 season following the departure of Jake Humphrey. BBC One will broadcast extended highlights of the first qualifying session of the season on Saturday, March 16, at 1pm, with comprehensive race highlights the following day, also on BBC One (except Scotland) at 2.15pm. Perry will be joined in Melbourne by David Coulthard, who will be on hand to provide lively analysis and discussion in the pits and paddock area. Commentary comes from Ben Edwards and Coulthard, with technical analysis direct from the pit-lane from Gary Anderson, while Lee McKenzie and Tom Clarkson will conduct the driver interviews. McKenzie will also host the BBC’s preview programme Inside F1 on the BBC News Channel on Friday and Saturday evenings. The BBC Sport website will have live streaming of BBC One’s broadcasts, as well as additional video content including highlights of practice sessions, qualifying and the race, plus interviews and analysis. BBC Radio 5 Live and 5 Live Sports Extra will have live audio commentary of every on-track session in Melbourne. James Allen will lead the commentary team for its live coverage of qualifying and the race on BBC 5 live. A variety of special guests will join them throughout the weekend. Commentary of Free Practice 1 and Saturday’s Practice session can be heard via the BBC Sport website only, with 5 live Sports Extra covering test cricket at those times. 5 live Sports Extra will have live commentary on Practice 2 on Friday morning, with both qualifying and the race live on BBC Radio 5 live. 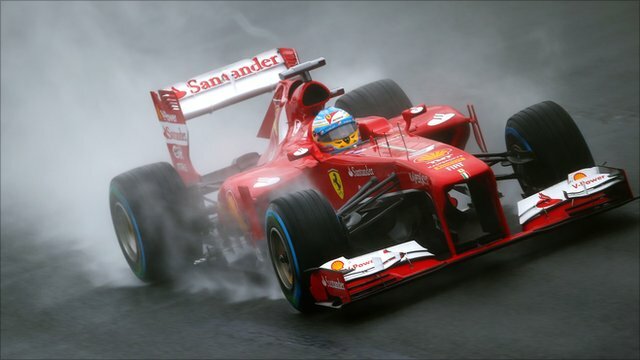 This entry was posted on Monday, March 11th, 2013 at 13:40 and is filed under Formula 1. You can follow any responses to this entry through the RSS 2.0 feed. You can leave a response, or trackback from your own site.